What are the hallmarks of a good serum? Using concentrated doses of ingredients, anti-aging serums can penetrate deep into the skin. Some of the most effective ingredients include hyaluronic acid, retinoids, hydroxy acids and antioxidants. A facial serum’s efficacy can also depend largely on how it is applied. Aging is inevitable. For those of us who want to keep the ravages of time at bay, a good anti-aging serum can be an effective solution. Often considered the skin care equivalent of superfoods, these concoctions can help you minimize your wrinkles, fine lines and dark spots without using too many complicated ingredients. High quality serums general have a shorter list of ingredients, but in strong concentrations. Having fewer ingredients also enables serums to achieve deeper penetration into the skin. With this ability comes greater efficacy. The markers of youth and old age are most visible in the region around the eyes. This is due to the fact that the skin of the eyelids is the thinnest in the human body. It’s thinness makes it especially vulnerable to damage inflicted by changes in the environment and variations in light exposure. So, it stands to reason that the ideal anti-aging serum is one that was created to take into account the delicate region around the eyelids. As with any other application, precautions must be taken before using an anti-aging serum. Nurse Duke clarifies that patients must “make sure that they do not have an allergy to any active ingredients.” Among the ingredients used in anti-aging formulations, there are several with a long track record of efficacy and tolerability. These include hyaluronic acid, retinoids, alpha hydroxy acids and antioxidants. Here we review the benefits of these key ingredients and how they work to turn back the clock. Of all the ingredients used in facial care, hyaluronic acid (HA) has one of the best track records. It occurs naturally within the human body and is responsible for vital skin functions, such as flexibility, strength and hydration. Due to its natural occurrence in the body, its synthesized form is considered one of the safest and most effective ingredients for skincare products. Serums containing HA do not provoke immune responses and are generally associated with stable long-term results. Thus, HA is used in a wide variety of facial skin care treatments. 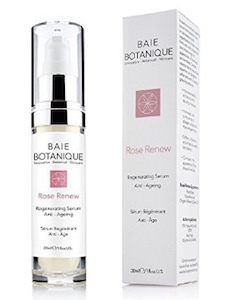 According to user reviews, Baie Botanic Anti-Aging Rose Hyaluronic Acid Serum represents an effective serum that contains HA and rose essential oil, which nourishes and restores the skin. This group of compounds are highly-regarded for their anti-aging effects. Retinoids incorporate natural and synthetic derivatives of Vitamin A. By themselves, or in combination, retinoids have proven to be versatile in the treatment of fine lines and wrinkles. According to Dr. Hardik Soni in New Jersey, retinoid anti-aging serums “induce the formation of new skin and collagen.” However, he cautions users to be mindful of dosage. “Most people never give retinoids a chance because they use them too frequently or use the wrong concentration,” he notes. For a more potent formulation, Asutra 2.5% Retinol Anti-aging Serum has received rave reviews. Dr. Soni insists that hydroxy acids are “another integral component to any skin care regimen.” This group includes glycolic acid, lactic acid, benzylic acid and mandelic acid. Their strength, he explains, lies in “causing chemical exfoliation, helping produce new skin as well as stimulating the formation of collagen.” Alpha hydroxy acids have long been a common ingredient in the treatment of skin that has been damaged by light. Among users, OZNaturals Vitamin C Serum + AHA Glycolic Acid has proven to be a promising product that can deliver results. The strength of these compounds lie in their ability to prevent or delay the adverse effects of ultraviolet light. These effects include damage to DNA, cell membranes, proteins and collagen. A host of other ingredients have demonstrated an ability to combat aging, including vitamins C and E, niacinamide, green tea, and caffeine. There are also a number of areas of anti-aging research that are yielding positive results. Of these, Dr. Soni notes that “Stem cells and novel delivery systems such as nano technology and liposomes hold promise for future ingredients.” However, he cautions that one needs to be “wary of exuberant claims” concerning these technologies and ingredients. It’s best to let the evidence speak for itself. One product that has many positive reviews is Peter Thomas Roth Potent C Power Serum. The main ingredient of this serum is a form of Vitamin C called Tetrahexyldecyl Ascorbate, which is 50 times more powerful than traditional Vitamin C. In addition, the serum contains Vitamin E and Ferulic Acid, which are powerful antioxidants. As with any medication, it’s important to bear certain factors in mind before applying an anti-aging serum. Adhering to these pointers will help you get the maximum benefit from your serum. First, cleanse the face with a gentle face wash before using the serum. Next, the most important factor to consider is quantity. As serums are highly-concentrated, you only need two or three drops for the entire face. Also, it’s imperative to avoid toners when using serums as these can dilute the serum and reduce its potency. Finally, massage the serum into the skin in a circular motion. If you spend time in the sun, use a sunscreen with a high SPF in combination with the serum. If you have dry skin, use the serum with an emollient. If you’re using multiple products, remember that low viscosity products should be used before thicker ones as the former contain more water. Therefore, using the thicker product afterwards will help seal in the moisture. Lastly, it’s important to bear in mind that the skin is most receptive to healing at night. Thus, most serums are at their most effective when applied at bedtime. There are some that can be used in the daytime as well, so make sure to review the indications for use before you apply the product. The drive to look younger is a human obsession that dates back to antiquity. The discovery of new anti-aging products and cosmeceuticals is a growing field in medical research. Thankfully, we live in an era where innovative solutions to the onset of aging are aplenty. Perhaps one day, these solutions will be permanent. Till then, we have many viable options to turn back the clock. Serums — when used correctly — can help us do just that. Pilkington, S. J., Belden, S., & Miller, R. A. (2015). The Tricky Tear Trough: A Review of Topical Cosmeceuticals for Periorbital Skin Rejuvenation. The Journal of Clinical and Aesthetic Dermatology, 8(9), 39–47. Bravo, B. S. F., Rocha, C. R. M. D., Bastos, J. T. D., & Silva, P. M. C. e. (2015). Comprehensive Treatment of Periorbital Region with Hyaluronic Acid. The Journal of Clinical and Aesthetic Dermatology, 8(6), 30–35. Fakhari, A., & Berkland, C. (2013). Applications and Emerging Trends of Hyaluronic Acid in Tissue Engineering, as a Dermal Filler, and in Osteoarthritis Treatment. Acta Biomaterialia, 9(7), 7081–7092. Prashant Bhawalkar was born in Mumbai, India and has lived in Sydney, Toronto, New York, Singapore, San Francisco, and Montreal. He has Master's degrees in English Literature and Journalism. He has worked in journalism, advertising, and corporate communications. At present, he lives in Montreal. His first novel, Unruly Times, was published in 2009. A satire on identity politics in literature, it went on to get longlisted for the Vodafone Crossword Book Award and the Man Asian Literary Prize.